Headed to Kickstarter Tuesday, 10/4, 10 Minute Heist: The Wizard’s Tower is a set collection/tableau building game from Daily Magic Games. Designed by Nick Sibicky (Who also designed the quite-enjoyable dice chucker King’s Forge) and gorgeously illustrated by Denis Martynets, 10 Minute Heist lets 2-5 players scale down a wizard’s tower, snagging artifacts, fossils, tomes, and more, in a scramble to leave with the most points! The wizard’s tower. We start at the top, and we steal everything that isn’t nailed down on our way out. That’s it. The only other rule is that once you move down, you can’t go back up. So the entire strategy of the game revolves around deciding whether you want to stay on a given level and clean it out (possibly letting your opponents zip past you to things they want below) or zipping past your opponents to snag treasure on lower levels (passing up anything on your current level for your opponent to possibly snag). Each treasure card belongs to a suit, has a value, and may have some special powers besides. 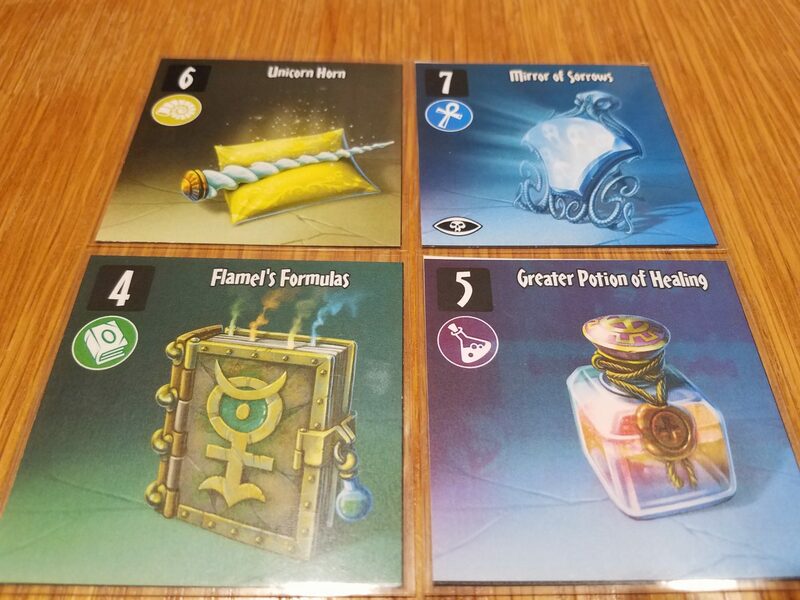 The reason you might want one treasure or another is that, at the end of the game, points are given out based on a series of criteria (who has the most value of each suit, or who has the most cards of a given value) as well as some penalties for the player with the most Cursed symbols (cursed cards tend to be more valuable than non-cursed cards). 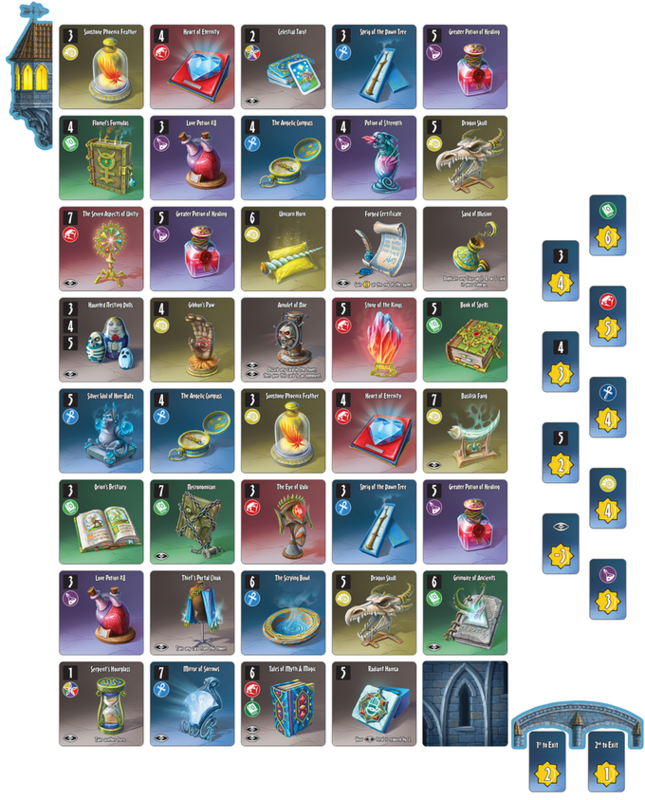 All strategic choices in 10 Minute Heist center around trying to build the most valuable sets cards, and all decisions boil down to ‘is it time to move down yet?’. It’s a dead-simple game, and the 10 minutes suggested in the title are probably a very liberal estimate – most games we played were done in half that. 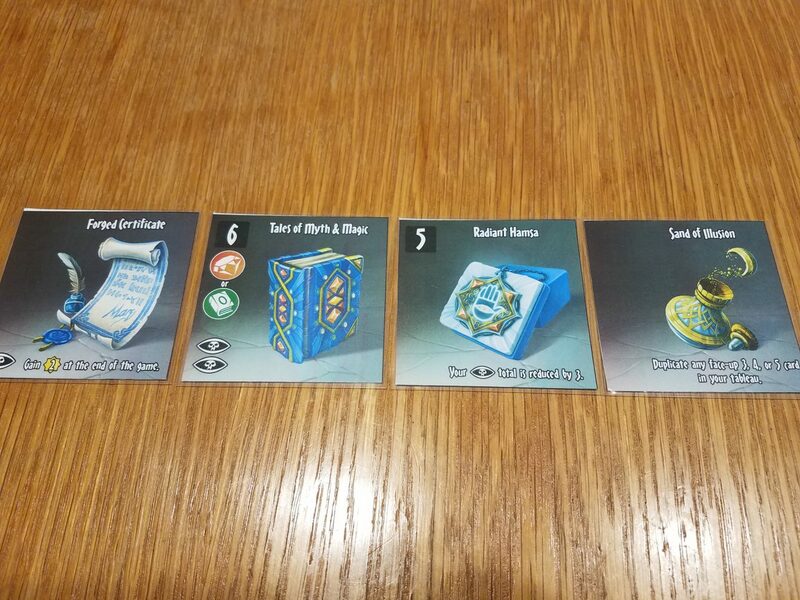 Some examples of our prototype cards. The color saturation will undoubtedly be better in the final product, and who doesn’t love a square card? Andrew: It may sound like an odd thing to laud, but I did appreciate the way scoring was handled. For all the cards that get piled into your tableau (especially in a 2-player game), scoring is really simple to calculate and VP distribution is as easy as handing players the scoring tiles they earned. Lots of ways to earn points, but everything comes down to majorities in suits or values. It really does simplify scoring nicely, though. Andrew: Ok, let’s talk for a second. 10 Minute Heist is a totally abstract game. 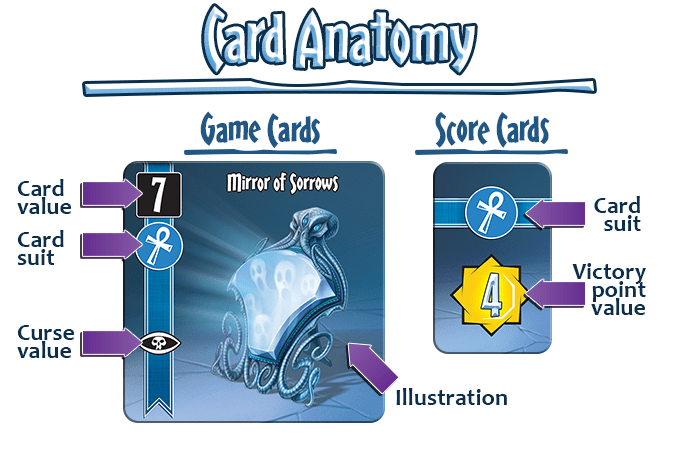 The theme, the gorgeous art (and it is gorgeous), card abilities, everything is pasted on. What we have here is a pure, but very pretty, set-collection game. The title may imply a time limit of some sort, but it absolutely doesn’t have anything like that. And while it may seem odd for a game to be titled after nothing more specific than its estimated playtime, that really does describe 10 Minute Heist surprisingly well – it could have been titled ‘Hey, Wanna Play A Game Real Quick?’. Jess: It’s a filler, that’s for sure, and the tactical decisions are really quite simple. There were one or two moments when I felt like my choices really mattered – either depriving an opponent of something that would benefit them or helping myself, but at the end of the day, it’s really just about who can snag the shiniest cards first. Andrew: Definitely, and that came through the most in the 2-player game. With more people, there is more contention and more dilution of sets, which makes the game way more interesting. Jess: Yeah, more players definitely helped. I don’t mean to sound negative about it, because I had fun playing it, but there isn’t a lot of game in 10 Minute Heist. That said, once we got a 3rd or 4th player, things got way more exciting, and I had a much better time with it. Some games really benefit from a little more contention, and this is definitely one of them. 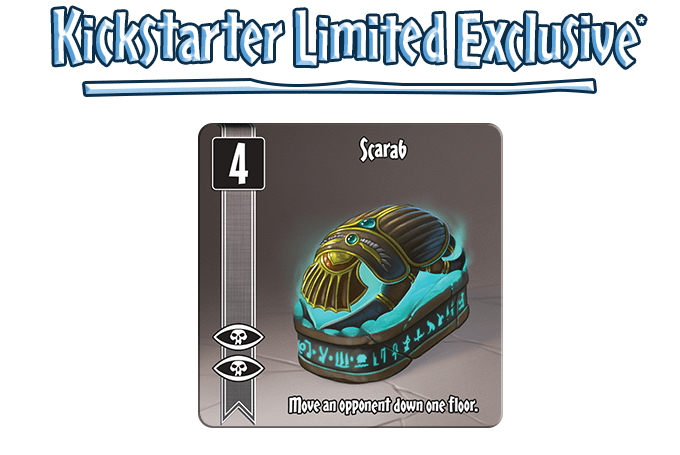 Backers will get this card, one of the only ways to aggro an opponent. Most of the time, you can’t interact with other players at all…aside from taking stuff they might want, obviously. Does all that mean we dislike 10 Minute Heist? No, not at all. It is mechanically solid and enjoyable enough, and since it comes from Daily Magic, it’s going to have ultra-high production quality and fantastic presentation. We had fun with it, for sure, but it is a simple sort of game that will be absolutely perfect for some groups, but may fall flat for others. Whether it’s for you or not is really about whether you’ll enjoy its straightforward mechanics and the fairly simple strategic choices which come from them. All that said, we do absolutely recommend heading over to the 10 Minute Heist Kickstarter page and checking it out when it goes live tomorrow!